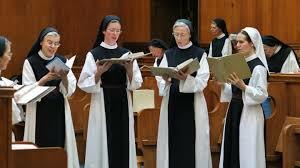 Question of the Week: "What it the main difference in living out the monastic life between communities of monks and communities of nuns?" I am the Father Immediate of our Order’s house of nuns in Central America. This provides me the opportunity to accompany a community of women journeying the same Cistercian grace as we monks of Vina to seek first the Kingdom of God. The question asked is what difference is there in living the Cistercian charism between a monastery of men and a monastery of women? On a spiritual and theological level there is no difference at all. “There is neither Jew nor Greek, neither slave nor free person, nor male and female; for you are all one in Christ Jesus,” Galatians 3:28. But on an emotional and psychological level there is indeed a difference. The difference can be expressed in terms of bonding. The relationship between a sister and her superior is noticeably closer, more intense and demanding than I find in a monastery of men. What is the lesson for me? No one is an island. We need one another. A healthy interdependence is not an option but necessary to open my life to trust, receive, listen, support, and love others, in other words to form and build friendship. And friendship is an essential component of our Cistercian charism.